Love having new plants for free? This project is for you. 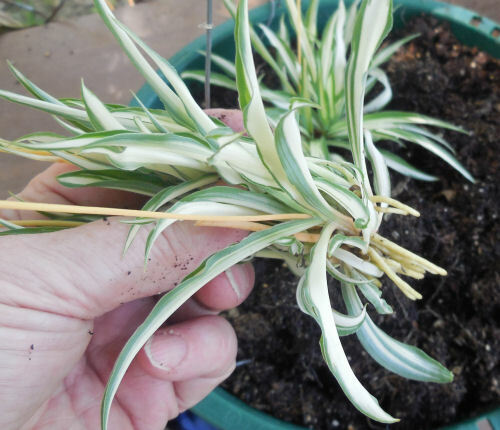 It is super easy to propagate spider plants from the babies that the mother plant sends out on the ends of long arching stems. 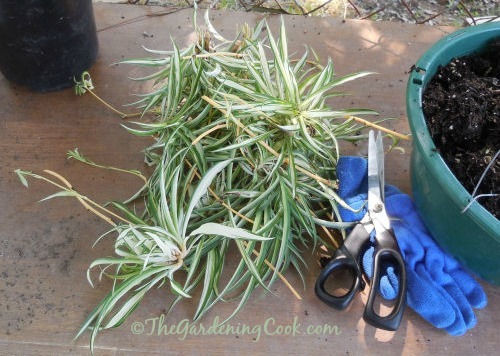 Spider Plants – botanical name Chlorophytum – are one of the easiest of plants to propagate. I first became familiar with this popular plant in Australia when I lived there. They were plentiful and I loved the little offshoots that the plant put out when it was mature. In most areas of the country here in the USA, it is considered one of the popular indoor plants, or grown as an annual outside in the summer. 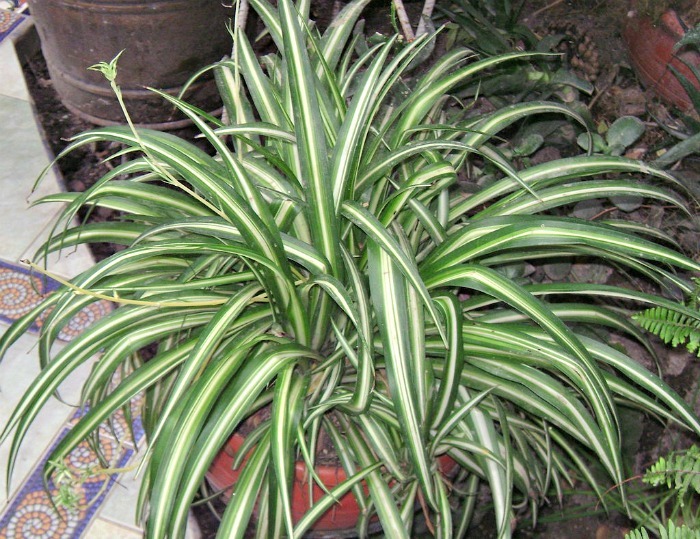 Chlorophytum are referred to by many nicknames – spider plant, airplane plant, St, Bernard’s Lily, ribbon plant, even (incorrectly) hens and chickens which is the more generally known nickname of a popular succulent. Although this plant is grown for its pretty foliage, it does have small flowers, too. 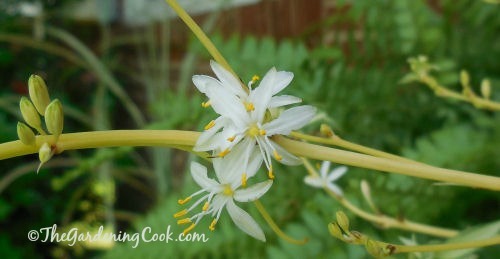 The plant sends out fine white delicate flowers in the summer and small baby spider plants grow out of these flowers. The flowers are quite small – only about 1″ in size and look a bit like a miniature lily. 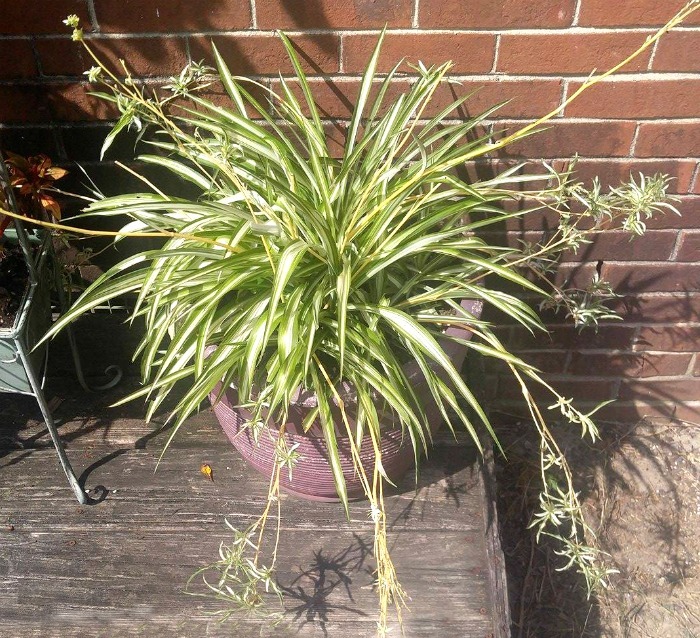 It is not uncommon for a well developed Spider plant to send out an offshoot that sends out its own offshoot. This results in a cascade of babies hanging down below the mother plant and each of her child plants. I find that my plants send out lots of babies if the mother plant is slightly pot bound. Once the roots are no longer vigorously growing, the plant gets busy on producing the babies. 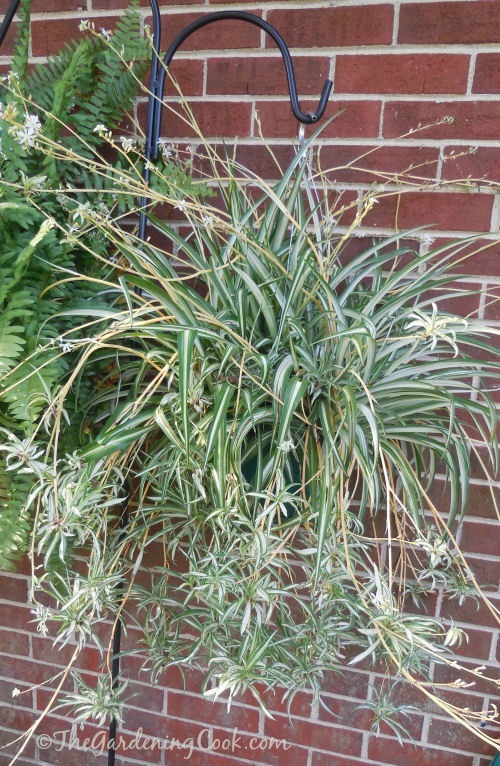 Once it does this, it tells you that it’s time to propagate spider plants. 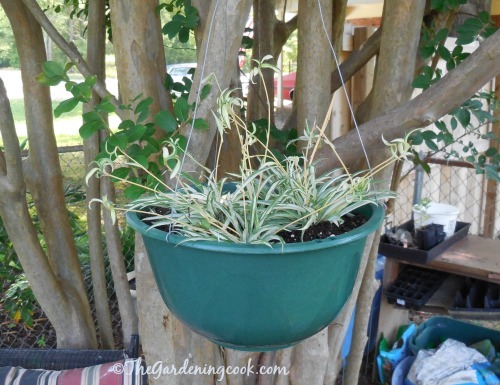 The plantlets are easy to grow for one simple reason – as they mature, they develop a tuberous root system right on the plant, much like an air plant. Those roots are just waiting to be planted in soil! 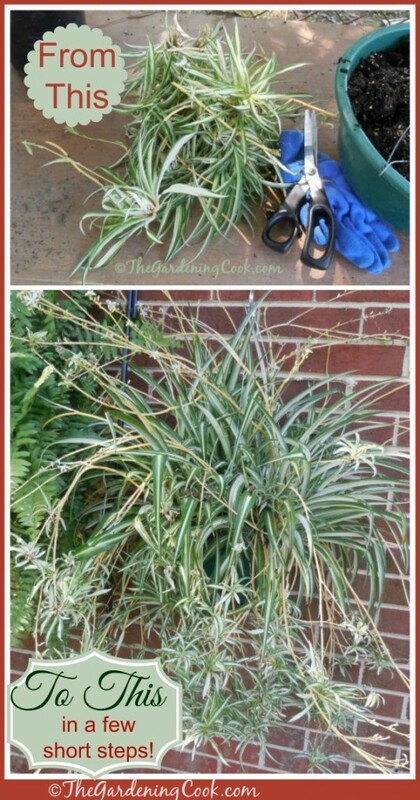 I started to propagate spider plants with a gorgeous, and very large spider plant. A friend of mine from Australia was visiting and remembered how much my husband liked the plant. On a trip to a garden center, we found this mature plant and she bought if for us as a gift. The mother plant had a ton of babies, even some with their own babies, so it did not suffer at all even losing a lot of them. I cut off some of the babies. I chose well developed ones that had a good root system showing and also chose some with babies of their own starting to form. This will ensure that my new planter looks like this one soon! I had several old planter with decent soil in it that held strawberry plants that I had managed to kill, so I just tilled up the soil with a garden fork so that it would drain well. It had some roots and weeds and those just got pulled out and tossed in the compost bin. (I’ll probably have strawberries soon growing in there with my luck.) I chose several of the largest babies with babies of their own and put five of them into my pot and tamped down the soil. A fresh watering came next, and then I hung the planter in the shade of my crepe myrtle tree near a seating area. It will get overhead watering until the roots have taken well. It won’t be long at all until my new planter looks quite like the mother plant. Easy peasy. About 10 minutes and a free plant. Who can beat that? I had babies left over but they did not have babies of their own. I wanted some of these. They will root and then grown in a new bed under a pine tree. The bed gets filtered light. I love green and white variegated plants and don’t want to spring for the cost of hostas or liriope muscari variegata, so they will give me that effect at no cost. Even here in my zone 7b garden, the babies spring back each year. I’ve had them in one other bed for the last three years, in spite of snowy winters. I hope these come back too! The babies take about 10 days to 2 weeks to root. Keep evenly moist. Water when the soil is dry about an inch down in the pot. Will grow to about 1 foot tall with runners cascading down about 3 feet or more. 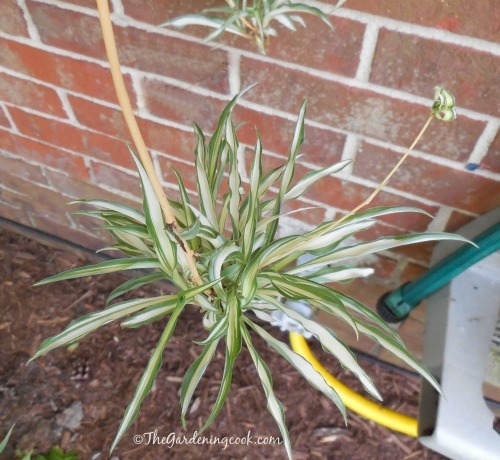 A nice bonus is that spider plants purify the air in your home! 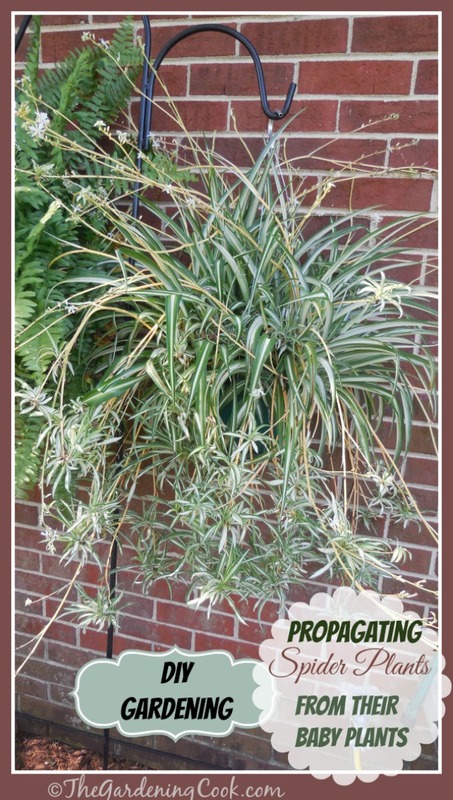 To show how quickly spider plants will grow, check out this plant. :It started from a single baby and I kept it indoors over the winter in a six inch pot. In early spring, I planted it in this large planter and it’s enormous now and has dozens of small babies. When I say plants for free, I really do mean it! 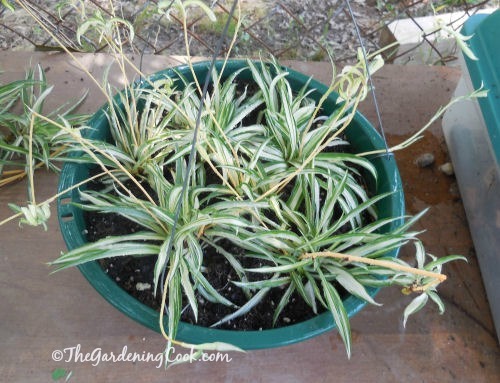 Have you tried to propagate spider plants from their babies? How did you make out? Me encantan.las plantas arañas…en.mi Panamá la conocemos como mala madre….porq tira los hijos fuera d casa jaja. Felicitaciines por tan.completo reporte…. Do you pull it out from the root, or cut the shoot and where? I said I wouln’t do this ever again; but something still wants me to propagate!! Why can’t I stop?? This Will be my last; I’m pretty sure!! Too funny. I am the same. Those babies are so much fun to propagate. 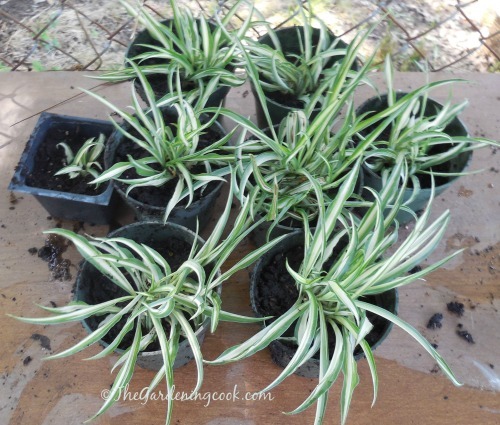 I just do a batch of them every fall so I will have large spider plants in the spring.